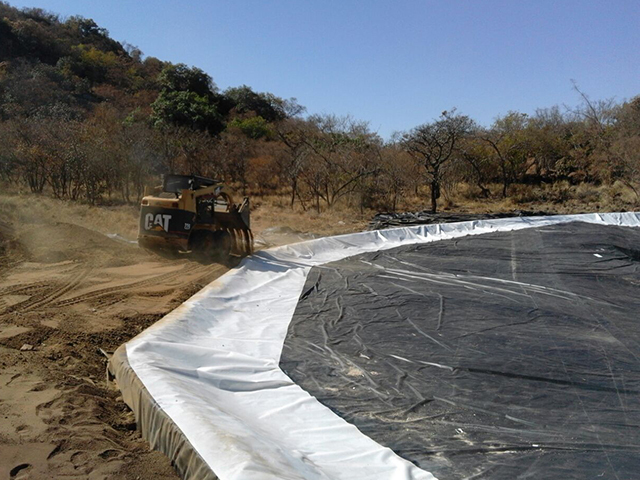 Tata Ma Tarps and Linings offer the same quality and strength liners for small and large ponds as we do for huge commercial type dams found on farms and mines. 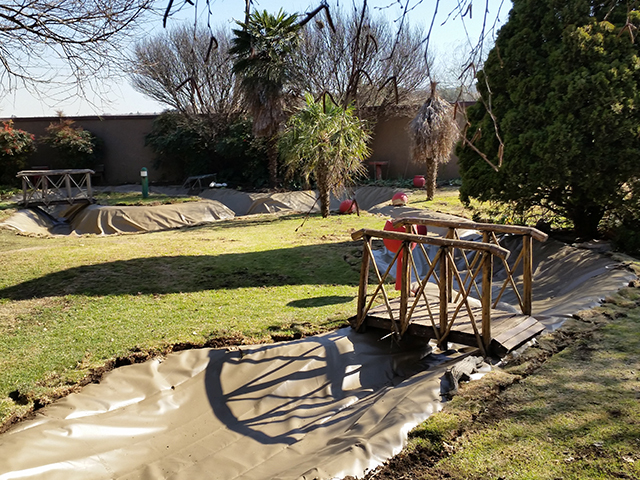 Our plastic pond liners are all manufactured from nylon reinforced PVC that are tough and durable. The liner material is soft and flexible and can take on the shape and contours of any varied depth pond. Our liners are fish friendly and are suitable for koi ponds and other exotic fish species, ducks and all other aquatic life species. 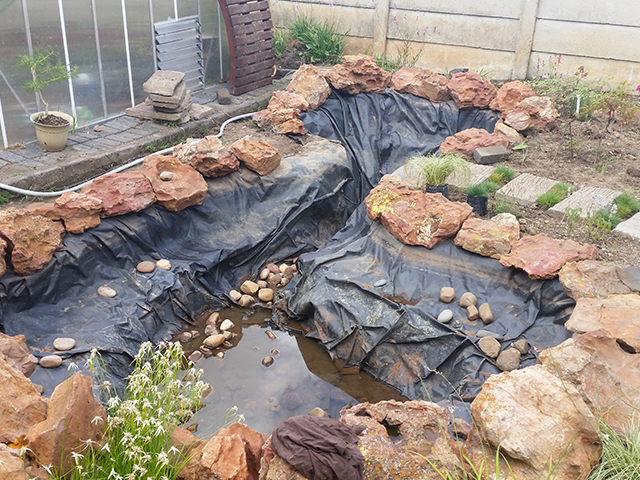 Some ponds may require a pre-liner or geo membrane as an under liner if the pond surface is a little stony or rough. A pre liner acts as replacement for a thin layer of sand and this protects the liner from beneath from any possible damage. We offer a recycled 320 micron PVC mesh (net) or recycled 400 micron reinforced PVC as cost effective methods of doing so. Please note that the pre liner cannot be used as a liner as it is perforated material. 400 micron – offered in both virgin and recycled materials. Suitable for most large ans small pond liner applications i.e. duck ponds, koi ponds and ponds purely for aesthetic value. This is our most popular liner due to it being the most cost effective option on the market. 420 & 570 micron – Offered in virgin materials. Suitable for leaking of old and pre-concreted and earth ponds i.e. fish ponds, duck ponds. 680 & 800 micron – Suitable for leaking earth, old pre concreted ponds where dogs or other animals may enter the water. A 320 micron PVC mesh (net) is a specialized reinforced PVC mesh that is welded into place on the dams walls to protect the liner from extended UV damage. 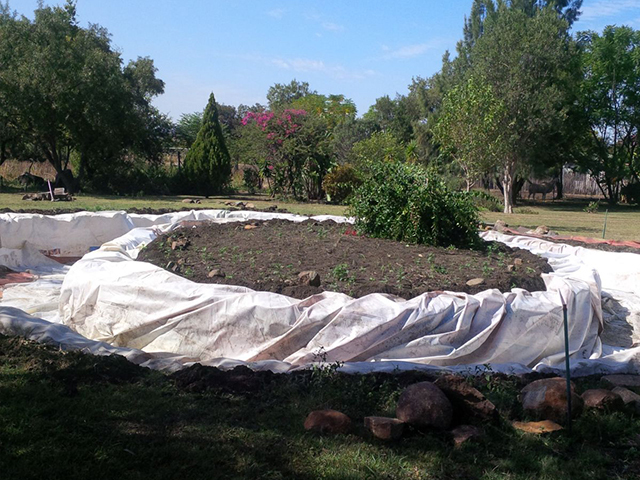 This is especially useful on ponds where the water levels are continually fluctuating, leaving the walls of the dams exposed to the suns UV rays on a daily basis or for an extended period of time. This is a cost effective way to prolong even the thickest pond liners life span. CLICK HERE: How to measure your pond to order the correct size liner.